I llive in Ljubljana, the capital of Slovenia, and I'm one sempervivum crazy woman. Have more than 1.000 different plants, but I am still looking for more. I grow lost labeled varieties and - of course - labeled cultivars and species. I am always willing to swap plants. I am also a editor of international sempervivum swappers list with free adds. Copies are distributed by email and are also free. In vol. 2 there are more tha 30 adds from all over the world with more than 2.000 cultivars and species listed. Vol. 3 of the list is due to early January, 2007 and all of you that want to place an add, do mail me your list by the end of 2006. Will also swap lost labels sempervivums (semps with no name) - have cca 250 different! Special offer for swapping unnamed (lost labels) species and cultivars in 2007 - you get doubled number of semps you sent in exchange (for example, you sent 10 & get 20, you send 26 & get 52 etc.!) Swap sedums, too. Also buying semps at reasonable price! If you are looking for a certain plant for your garden - do post a free add in Slovene garden forum - we have a forum for foreigners. If you have troubles regitering, mail me. Hello renee. I wonder would you be so good as to post up some tips on Sempervivum growing, propagating, feeding etc. It would really add to this thread. and stop it getting removed I reckon. I m afraid no one here has interest in Sempevivums - so what is the point of writing about cultivation?! Ah your not going to give up that easy. Did many other english speaking gardeners visit the Sempevivum forum you linked to. Educate us so that we can grow an interest in them . I presume you want to spead the message to the masses? Sempervivums are members of Crassulaceae family, a frost hardy succulents that will stand any sort of neglect ... That's why they are doing so well in any rock garden. There are some 70 species (including ex Jovibarbas) and obout 4.000 namred varieties - cultivars. And now a question - how many of you grow sempervivums? I grow a few. Some very similar in colour and shape to the picture you posted. They don't grow very well for me unfortunatly as parts tend to die back and the centres become loose and tend to fall out with the slightest touch. Any idea what I might be doing wrong? ... looks just like a semp, right? Birdie, probably too much water (rain, moisture from fog ...) is causing your problem. Semps need soil that dries out completly ....They are unhappy in damp conditions. I hope you grow them in a full sun or partial shade, Sempervivums are not plants for shade. The problem you described sound like rot to me. NAy creatures in the soil? Most probably not! Full sun alright but i think it is the damp irish weather which is doing them in. might try growing some in pots as they should not be so damp. RENEE, I am not too sure but is this a Sempervivumus? When i bought it, it didnt have a label, but i am glad i bought it...!! 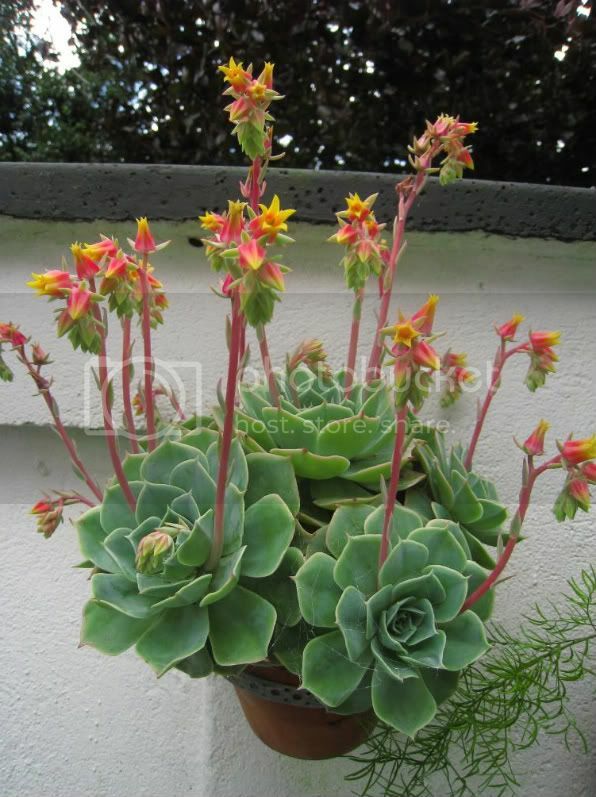 That on the photo is defintely an Echeveria - I can tell from flowers. Americans (wrongly) call Echeverias hen and chicks, like tjhey call semps, too. And that is the beginning of many mistakes ... the common name "hen and chick" I mean. Same common name for two quite different plants. I now have a sempervivum blog. I also have a new garden, so in 2009 there will be more news.